Can the film be waxed? While you can wax the film, be sure the product you are using doesn’t contain Naphtha or Kerosene in concentrations over 5%, and also avoid waxes that contain dyes. For best results, we recommend using our XPEL Flawless Finish Paint Protection Film Sealant. This product has been specially formulated for use with polyurethane paint protection films to provide the maximum protection and gloss, while containing no ingredients that would cause discoloration over time. Can XPEL be installed on signs? Yes. 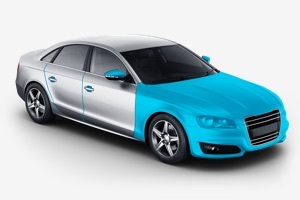 Paint protection film can be applied to any smooth painted surface. Yes. The process is the same as with regular paint: wet the surface with a lubricant such as soapy water and then gently rub the surface with the clay bar. For stubborn insect, bird dropping, or hard water stains, use Simple Green as the lubricant for the detailing clay. How do I maintain XPEL ULTIMATE PLUS? No special maintenance is required for XPEL ULTIMATE PLUS. However, the film will last longer and will be easier to clean if treated twice a year with XPEL Flawless Finish Paint Protection Film Sealant. Will XPEL ULTIMATE PLUS yellow over time? Do you have a colored paint protection? We are currently working on limited beta versions of our ULTIMATE PLUS film in gloss black, matte black, and gloss white. Please contact customer support at 800-447-9928 for current availability. Do you have a first time buyer discount? Can I purchase precut film for my vehicle? Yes, our pre-cut kits are available for sale on our website, www.xpel.com, or by calling our customer support team at 1-210-678-3700. However, as installation can be quite difficult without previous experience or formal training, we recommend having installation performed by one of our Factory Trained Installers. To find an installer nearest you please visit our Installer Locator to find an installer near you. Can XPEL be installed on your windshield? No. Because of the impact absorbency of paint protection film, the refractive index of the film is too different from that of the windshield. Because of this difference, putting the two together causes a distortion when looking through the glass that would be unacceptable to the vehicle’s occupants. Can I have XPEL film installed in Germany? Yes. We have installers available worldwide. Please visit our Installer Locator to find an installer near you. Will TracWrap stick to a vinyl wrapped car? Yes, TracWrap can be applied to vinyl. What if my installation was done incorrectly? It is always best to contact your XPEL installer first and explain your concerns. We do our best to maintain a network of installers that stand behind their work. If after doing so, your installer cannot or will not address your concerns to your satisfaction, please contact our customer service team for assistance. They will get you in touch with the XPEL Representative for your area who will work to find a solution to the issue. Can I cover my whole vehicle with XPEL Film? Yes. Any smooth painted surface can be covered with paint protection film. Can XPEL be installed on my airplane or aircraft? Paint protection film can be applied on any smooth painted surface. However, given the tight tolerances on weight, balance and other factors on some aircraft, it is highly recommended to consult with the manufacturer of the airplane for strict guidance. How can I wax STEALTH without it looking shiny? While there is no reason to wax STEALTH, if you wish to do so, we recommend using our XPEL Flawless Finish Paint Protection Film Sealant. When applying the sealant, work in small areas thoroughly wiping away all excess before moving on to the next section. Yes. But wait 48 hours after installation to allow the film to dry completely. What happens if you put Acry-solvent on the film? Acry-solvent, or any other Xylene based solvent, will not harm the film unless left sitting saturated in it for an extended period of time. To use this type of solvent on the film (for removing stains, etc.) wet a microfiber towel with the product and wipe the film for one or two minutes. If the stain remains, allow the solvent to evaporate and then repeat the process. How thick is XPEL ULTIMATE PLUS paint protection film? XPEL ULTIMATE PLUS is 8.5 mils (.0085 inches) thick. Can XPEL be installed on boats and other watercraft? Can I install XPEL ULTIMATE PLUS Paint Protection Film myself? Other than the simplest body panels, application of paint protection film is a process which requires a good deal of experience and training to obtain satisfactory results. The compound curves present on most surfaces require the film to be stretched and compressed in a very controlled way to ensure proper adhesion without distorting the adhesive. As such, it is highly recommended that the film is professionally installed. If I apply a ceramic coating to STEALTH, will it make it shiny? It depends on the coating. Some may deepen the finish while others may add unwanted gloss. We recommend testing the coating on a swatch of unused film or in an inconspicuous area before coating a protected panel. Can I have XPEL installed over my Vinyl Wrap or Racing Stripes? Yes. XPEL film can be applied over a vinyl wrap or graphics. However, if there are any hard edges that film must cross (as in the case of stripes), it could result in some air being trapped along that edge. Can XPEL be installed on your vehicles headlights and fog lights? Can XPEL film be installed on the glossy interior panels of my car? Yes. XPEL ULTIMATE PLUS can be applied to any smooth surface, though care should be taken around any electronics and/or switches so that installation fluids aren’t allowed to get into sensitive areas. Can XPEL paint protection film be installed on a brand new vehicle? Yes. Factory paint is fully cured before the car ever leaves the assembly line. What can I use to clean the film with if the Film Cleaner isn’t working? XPEL Film Cleaner is generally designed to remove dirt, grime and oils from paint protection film that lead to yellowing over time. To remove stains from other substances such as insects, bird droppings or other compounds, use acetone or lacquer thinner with a soft microfiber cloth. The self-healing clear coat of our ULTIMATE PLUS and STEALTH films is designed to repair itself from swirl marks and light scratches from car washes, etc. If a piece of debris has penetrated all the way through the clear coat on the film, it will not self-heal. The only way to fix this would be to have the piece of film replaced. How can I remove the excess adhesive after I removed the film myself? If there is left over adhesive upon removal, you can use a general purpose adhesive remover, often found at your local auto parts or home improvement store. Does the 10-year warranty on ULTIMATE PLUS transfer to another owner if car is sold? The XPEL ULTIMATE PLUS, STEALTH, and XTREME warranty is transferable to another owner with proof of purchase. Once the film has been removed from my vehicle, can I re-use it on another vehicle? No, the film once applied and removed cannot be reused. Can I install XPEL paint protection film on aluminum or brushed metal accents on the car? Any of our paint protection films can be installed on aluminum or brushed metal, though they may change the appearance to some degree depending on the film you choose. We recommend having your installer apply a small swatch of the film to the surface in question to determine the appearance prior to full installation. What is the best polish to put on your car after you have had it wrapped with XPEL ULTIMATE PLUS? We recommend using our XPEL Flawless Finish Paint Protection Film Sealant. This product has been specially formulated for use with polyurethane paint protection films to provide the maximum protection and gloss, while containing no ingredients that would cause discoloration over time. My car dealer applied a paint sealant to my vehicle, can I have XPEL installed over this protectant? Waxes, sealants and protectants are typically designed to reduce the surface energy of the paint, making them easier to clean etc. A reduction in surface energy will reduce the film’s ability to adhere to the paint and could cause long term adhesion issues. Because of this, we generally recommend removing these types of products before installation. If these types of coatings are to be used, we recommend applying them AFTER installation of our paint protection film. Can I apply a ceramic coating on top of the film and how does it affect the self-healing feature of XPEL? Yes, Coatings can be applied to the films. Adding a coating does not stop the film from self-healing. Coatings can add a protective layer over the film, which depending on the coating can provide different properties (Please contact your installer or coating company for more information). That additional coating layer, depending on the coating applied, may or may not self-heal. Once the coating wears down and deteriorates, the self-healing qualities of XPEL ULTIMATE PLUS and STEALTH will still remain. How do you remove the material and what kind of residue or marks does it leave on clear coat type paint? Please see the diagram in the link below and be sure to use a steamer or heat gun to soften and warm the adhesive. This will yield the best possible results and will leave little if any adhesive behind. Any traces of residue left behind can be removed with any commercially available adhesive remover that is safe for automotive paint. What would be the best way to protect the rocker panels on my truck from getting damaged from rocks and road debris? We offer pre-cut rocker panel coverage for most trucks and SUVs that can be professionally installed by our independent dealer network. Visit our Installer Locator for an installer near you for a quote. We also make a rocker panel DIY kit to help protect your rocker panels. This product is available in our XPEL ULTIMATE PLUS film or our XPEL ARMOR film. ULTIMATE PLUS is our clear self-healing paint protection film, while ARMOR is a rugged 30 mil film that is black and has texture similar to a spray in bed liner. Can you wrap a whole car in the same way you can Color Change a vehicle (dismantling first) from bulk pieces of Paint Protection Film? Yes. Assuming you and the installer are both comfortable with the risk, there is nothing about the film that would prevent this from being done. We also have designs for most body panels on nearly every vehicle, which would allow installation without dismantling the vehicle. Can I install a vinyl stripe on top of XPEL paint protection film and will I be able to remove the stripe without damaging the clear protection? Do you make a clear film that could be used to protect a windshield without distorting one’s view, or breaking the glass due to expansion/contraction? No. We do not currently offer a windshield protection film. I have installed the kit on my headlights and they looked fine, but now they look foggy. Did I do something wrong? Is it best to apply your light protection kit to the lenses wet or dry? I have the headlamp kit almost completely applied using the wet application method, but I can’t seem to get the edges to completely stick down. What am I doing wrong? It is absolutely imperative that a hairdryer or heat gun is used in this area to seal the edges. The heat serves two purposes. First, it helps evaporate the remaining alcohol/water solution from under the edges, and second it makes the plastic more pliable so that it can contour to the shape of the light. Be careful if you are using a heat gun to warm the plastic. It takes only a small amount of heat to apply the material. If you apply too much heat you can damage the surface of the plastic. What if I want to remove the headlamp shields at a later date? What is the warranty period for your window films? We offer a transferable lifetime warranty on both the CS, HP and XR series. The warranty covers against cracking, peeling, bubbling, delamination, fading and color change for the life of the film. The warranty is transferable and will continue with the car even in the event the ownership change. What sizes of Window Films are available? Do you offer residential/commercial window films? Since XPEL is a leader in automotive products our first concentration has been helping our dealer base expand in the automotive business. There are plans in the works to ultimately offer a full lineup of products including architectural and security films. When removing the film does the adhesive stay on glass or on film? Our window film is designed to with a very strong adhesive for durability, upon removal of the window film the adhesive will not fully transfer to the film and will remain on the glass.